This section is from the book "Warne's Model Housekeeper", by Ross Murray. See also: Larousse Gastronomique. This splendid dish, worthy of a pence's table, is only too locally known. It is, of course, only eligible for the table in its cygnet state. Young swans are called cygnets from the Latin name for the parent bird, cygnus olor. The swan of our rivers and ornamental waters is the mute or tame swan, kept from flying away by having one of its wings pinioned. The mute swan pairs, and builds its nest amongst the rushes on the shores of small islands in the river or the banks of pieces of water. With wonderful instinct these nests are built up to some height, in order to preserve the young birds from any sudden rising of the waters. The cygnets when hatched are of a slaty grey, which grows lighter as they grow older. The cygnets of the wild swan are white. But it is of the grey cygnets we have to speak. They are hatched in June. If it is intended to eat them they must be taken from their parents and put into a separate swan pond, at the end of August or first week in September. After they have been "hopped or upped," as it is called, from their native place grass is thrown to them twice a day with their other food for a fortnight. They are fattened on barley; a coomb each cygnet suffices for the fattening. The corn is set in shallow tubs just under water. * A Glaze. - One dessert spoonful of Indian Soy and the white of one egg. This is sufficient for two Hams or three Tongues, or for rather more than a Boar's head. Cygnets can only be fattened before the white feathers appear; after that no feeding will do any good; as soon as a white feather shows they will cease fattening, no matter what food they have. They can consequently only be eaten in December, and are a capital and very magnificent Christmas dish. Their weight then will be from 25 lbs. to 28 lbs. 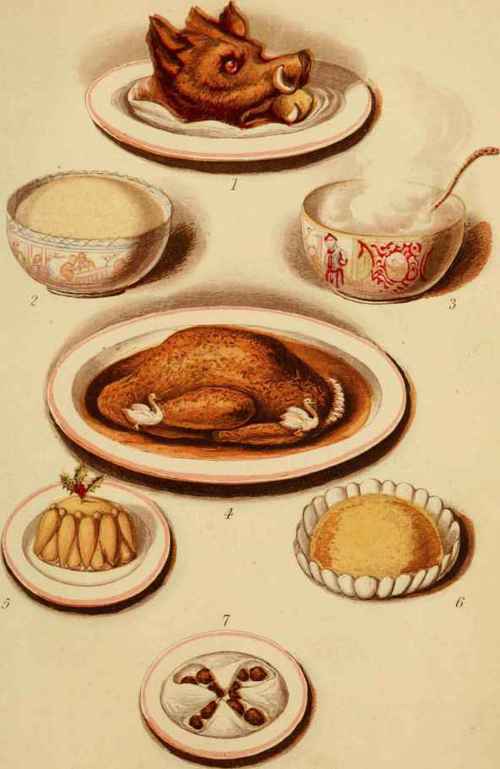 We give now the "how to cook swans" supplied to the Publishers from the place where the dish is native, i.e. Norfolk. Time, two hours for 13 lbs. weight. Cygnet must not be skinned; pick the bird, and truss like a goose; take two pounds of rumpsteak, chop it fine, season well with spice, a piece of onion or shalot, and butter. Rub the breast both inside and outside with beaten cloves, then stuff with the above, taking care to sew the bird up carefully and to tie it up very tightly on the spit, so that the gravy may not escape. Enclose the breast of the Swan in a meal paste, after which cover the whole bird with paper well greased with beef dripping. About a quarter of an hour before the bird is taken up remove the paper and the paste, baste well with butter and flour till brown and frothy. A swan of 13 lbs. weight requires about two hours roasting, with a fire not too fierce. Cut out some tiny swans in white turnip for garnish, put a swan (in turnip) on each leg and each wing, and a paper frill, nicely cut, about the shoulders* - See Plate. A squeeze of lemon improves swan when eaten, and fried bread crumbs should be served with it. Cut six pounds of the knuckle of veal, and one pound of lean ham in a large dish, add three onions, two turnips, one carrot, two heads of celery, a small piece of sweet basil, marjoram, thyme, parsley, and bay leaf, and a tablespoonful of salt. Butter a stewpan lightly, put in the whole of the ingredients, add five cloves, two blades of mace, and half a pint of water, stew it over a brisk fire about twenty minutes; when it becomes a nice light brown colour. Put it into the Swan - that is, when you've caught her. Will heighten the flavour in gourmands' opinion. That the gravy, and other things may not escape. And some whited brown paper should cover the rest. Fifteen minutes at least ere the swan you take down, Pull the paste off the bird that the breast may get brown.